Pashmina Shawls and Wraps, Lightweight, Warm and Soft Pashmina shawls are the most versatile and comfortable wraps. They may be 100% pashmina or a blend of 70% pashmina and 30% silk or acrylic. 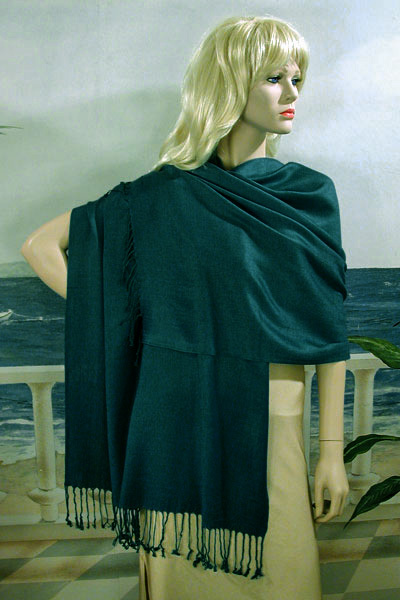 These lightweight, warm and soft shawls are perfect for spring, summer and fall. They are large, fashionable and come in a wide variety of colors. They make an excellent wrap for day or as evening. In the summer they look great on the beach with a a maxi dress and hat. For a cool evening complement your outfit with one of the many available colors. Some may have slight imperfections. Color: beryl Hue: Code: #277475.